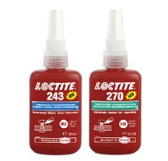 The Loctite brand, part of the Henkel portfolio since 1997, is renowned for the excellence of its adhesives and sealants. Since the original development of a unique anaerobic technology more than fifty years ago, Loctite products have become vital components in many of the machines and products that are at the core of everyday life. In today’s competitive markets, companies need the capacity and flexibility to respond quickly to new challenges. These needs are met with a strong commitment to research and development that has resulted in the most technically advanced range of products available today: Products that speed manufacturing processes, reduce costs, improve quality and comfortably meet national and international standards.